There was a time when all a good MPV needed to do was to provide space for all the family and their luggage, and have a big enough fuel tank to cope with long motorway journeys. Things are a little different now, though. Outright space is still important, but how that space is packaged is even more critical. A new people carrier should offer a versatile interior that can adapt to a raft of scenarios. If it seats seven, the rear pair of seats should be able to fold flat into the floor, and the seats should be able to be moved and folded independently of each other. Our favourite MPVs also provide a comfortable, relaxing environment, plus plenty of safety kit to protect passengers from harm. We expect them to have a generous standard specification, combined with running costs that won’t break the bank, too. With an appealing and practical interior and a comfortable ride, the Kia Carens impresses in most of the key areas MPV buyers will be looking for. Sure, it’s pretty ordinary to drive and access to the rear seats isn’t great, but it’s competitively priced and well equipped. This is one of the better mid-size MPVs, and it should be on your shortlist if your budget is less than £20,000/$26,600. A roomy boot and seats that slide and fold independently mean the C4 Picasso is one of the most family-friendly new cars. The sleek, uncluttered dashboard is a seriously classy feature, too. The Citroën isn’t as good to drive as some rivals, but it’s far more spacious, stylish and economical than most cars in this class. With a strong range of diesel engines and smooth handling, the Sharan feels more like a saloon car to drive than a full-sized MPV. There’s an excellent driving position on offer, and the cabin is fairly practical – even if the Sharan can’t offer many of the clever seating tricks of its rivals. Entry-level models are well equipped, too, meaning there’s rarely any reason to look further up the range. The Alhambra was our MPV of the year for three years running between 2011 and 2013, and it’s still one of the best around – it’s spacious, refined and great value for money. It can be a fairly big car to get used to, but in return you get near faultless practicality and space for seven adults. In fact, it’s one of the best seven-seaters on the market. The new 1.6-litre diesel Zafira Tourer is a big improvement over the 2.0-litre model it replaces. Power is delivered more smoothly and there’s hardly any of the clatter that you might expect from under the bonnet. It’s a tempting proposition for company car drivers, too, due to its sub-110g/km CO2 emissions. Add in the user-friendly flexible seating set-up and this is a great value MPV, especially in our recommended Tech Line trim. If you’re looking for a family MPV that won’t cost a lot to run, the Ford S-Max is well worth considering. Like the best modern Fords, it’s also one of the best-handling cars in its class, combining plenty of grip with excellent body control. In fact, the S-Max is the most fun MPV to drive. The interior might not be as classy as some rivals, but it’s as practical as you’d expect from a family car. It has a fairly large boot, too. We named the C3 Picasso as the best budget MPV in our 2017 Car of the Year awards. It has an airy interior and a large boot, plus most versions ride well on supple suspension. It might not be as good to drive as a Ford B-Max, but it’s excellent value for money. It’s worth noting that this model is soon to be replaced by the C3 Aircross, so make sure you get a sizeable discount on the outgoing car. The Grand C4 Picasso is so good that we’ve previously named it as our MPV of the year twice, once in 2014 and again in 2015. Its 1.6-litre diesel engine is smooth and efficient, while the classy, minimalist dashboard and airy interior make it a comfortable and relaxing place to spend time. Factor in easy-folding seats and generous standard kit and it’s easy to see why this is still one of the best MPVs you can buy. If you need to carry seven adults and some luggage as well, the Galaxy is the way to go, and we named it as the best MPV for more than £26,000/$34,580 at the 2017 What Car? awards. All models offer a flexible seven-seat layout with three sliding individual seats in the middle row and two rear seats that fold flat into the boot. The Galaxy is also one of the best MPVs to drive, offering the kind of nimble responses normally reserved for much smaller cars. The Volkswagen Touran has the most spacious and practical interior of all mid-sized MPVs. The roomy middle row of seats slides and folds easily and the two rearmost seats offer enough space for adults. It’s also comfortable and good to drive. The Touran might be more expensive than some rivals, but it’s definitely worth the extra cost. It’s well priced and fun to drive, but the Fiat Doblo has unsinspiring looks, and wind noise is an issue. A lack of key safety equipment and poor road manners make this big Ssangyong hard to recommend. 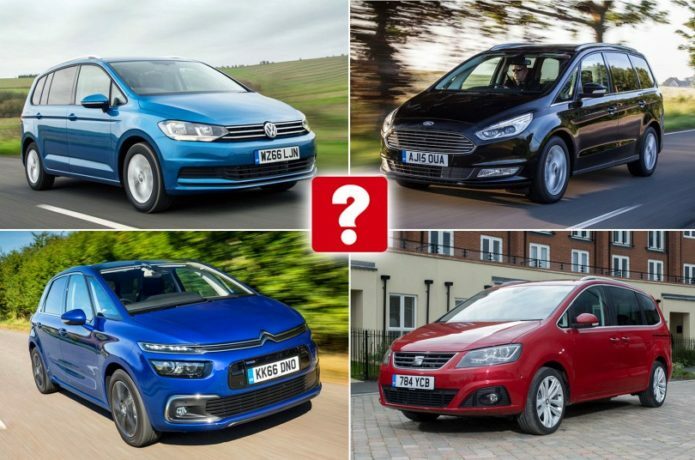 For more information on some of our favourite seven-seat MPVs, watch the group test video below.